The New year may have only just started but CCR are well into their 2013/14 bouting season. Currently the Birmingham team are in the middle of playing 4 games in 4 weeks. 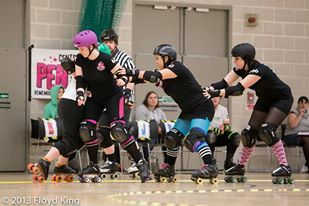 This weekend, things continue to gather momentum as CCR’s B-Team head into the sprawling fields of Herefordshire to play, you guessed it, Hereford Roller girls. Officially the two teams have never met before, however, there is history between the players with founder of the Hereford team being a very familiar face. R2-Dee2 considers the connection CCR shares with Hereford. Friendships aside, both teams are ready and raring to go, hoping to start 2014 how they mean to carry on. Can the Slay Belles continue their streak or will the Bullies stamp it out? In the following weeks the B-team play Wiltshire away, and there will be an Intra league game: Bad Apples vs Queens of Steel. Come along!